They say good things come in small packages, or is it to those that wait? Anyway good things don’t always have to be big, sometimes it is the little things that really amaze you. For some it’s a note left to remind someone about a special day, others its puppies, and for some, it’s a mini bottle of their favourite vodka. You see, we’ve been down the lab again watching one of the best films from the 80s, no not the Terminator, Honey, I shrunk the kids of course, and while experimenting we may have accidentally re enacted the film a bit too well! 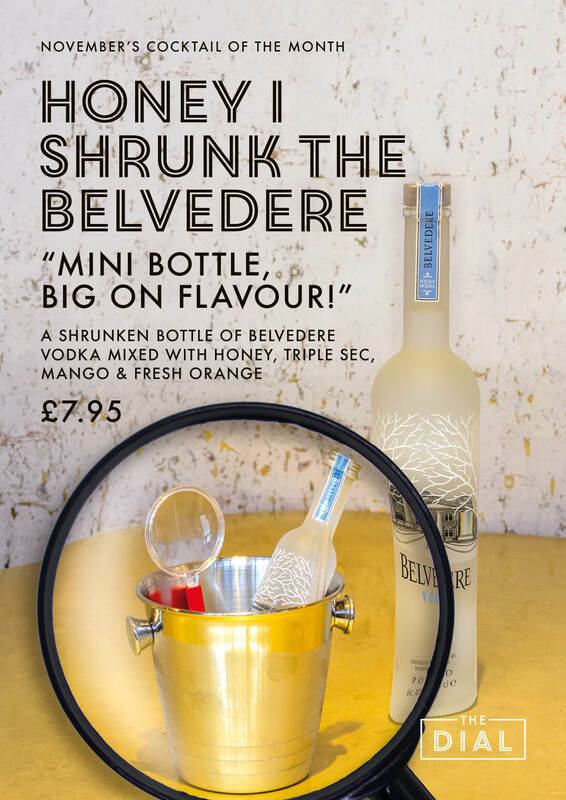 We were mixing up another great cocktail using the great Belvedere vodka and in our experiment, we accidentally shrunk all the bottles! And a guy called Wayne. Not one to be defeated, we made it work into another bite sized cocktail of the month! Wayne’s not in the cocktail though don’t worry, we cant find him, last we saw he was riding on the back of an ant having a right good time. Anyway, back to the important stuff, drink! We have gone ahead and mixed pure Honey (which Wayne got us from the hive), with triple sec, mango and orange juice and put it all in a mini ice bucket. On top, a full bottle of Belvedere Vodka is served on the rocks, sure it’s a mini bottle, but add this to our mix and you will find that it is full of character. Just like Wayne was…. Is. It’s up to you how strong you make the drink, just pour in how much you want, we recommend having it all. It’s tasty! You will soon see that being small is a good thing, in the film they fall into a bowl of cereal, sounds like a dream come true to me, Cereal is the best meal of the day. I’d swim in that goodness all day! But also, it’s the small things that really make a difference.